TONASKET — I had the opportunity to spend some time in the Tonasket area last week and rub elbows with ranchers as well as staff and supporters of the Okanogan Land Trust. The Land Trust is doing important work in farmland preservation in this area that will pay dividends for generations to come. I came away from my visit with an appreciation for the strong sense of community that exists in this valley as well as a feel for the development pressures this area is experiencing and the challenges that will present to those who want to continue ranching. The landscape in this part of North Central Washington is absolutely breathtaking and it is abundantly clear that the ranchers here are tremendous stewards of the land. Jerry DeBacker, the executive director of the Okanogan Land Trust, was kind enough to show me around some of the projects that have been accomplished in the area. We toured the 1,600-acre conservation easement that Bob and Nancy Barnes of Ellis Barnes Livestock Company negotiated with the Land Trust. The permanent agricultural easement extinguishes development rights on the property, which would be very desirable for housing. Conservation easements are essential tools to protect farmland for the long term. DeBacker has more two decades of experience with land conservation in Idaho, Montana and Washington. He said Okanogan is his dream job because of the incredible landscape that he gets to experience on a daily basis. 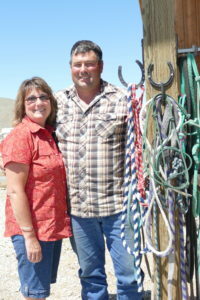 These ranchers are the best land stewards he has ever seen, DeBacker told me. The Land Trust has 10,000 acres of conservation easements in Okanogan and Ferry counties, DeBacker told me. They make sense for families that want to ensure the land is used for agriculture for the long term and for those who are doing estate planning to help future generations can continue to operate. Ranchers and farmers get cash up front that they can plow back into their operations to improve the viability of the operation. Families make a financial contribution to cover the stewardship costs that will be borne by the Land Trust in perpetuity. Conservation easements haven’t been an easy sell in Okanogan County. A few years ago, the county commissioners at that time inexplicably came out in opposition to the sale of development rights. For a time, that opposition meant that farm families in Okanogan County were denied the opportunity to sell development rights and those funds ended up helping farmers in other counties. The misconceptions continue, DeBacker told me. One big myth is that conservation easements take property off the tax rolls, but that is absolutely false. Derek Olma of OC Ranches, told me his property taxes haven’t gone down since his conservation easement went into effect in 2016 on property near Havillah. He said the county actually got some real estate excise tax money when the development rights were extinguished, so he had a hard time figuring out why commissioners were objecting. Ultimately, they supported his application. He said he had agreed with the commissioners on a lot of issues but their original position on the conservation easement issue left him scratching his head. Debacker also showed me another important project that the Land Trust is working on in collaboration with the Working for Wildlife Coalition, a partnership made up of tribal, state agency, conservation,and hunting organizations and other partners. There is a project to create an underpass for wildlife under Highway 97 north of Tonasket, an area where cars hit some 300 mule deer annually. That safe passage project will require an investment by the state Department of Transportation. The good news is that good data has been developed that shows the migration patterns of mule deer that give strong scientific support to the project. 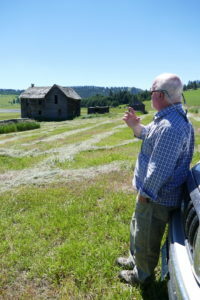 The farmland preservation efforts of the Okanogan Land Trust are worth sharing and perhaps replicating in other parts of North Central Washington. While attending a Land Trust event Saturday night at the exquisite Esther Bricques Winery, I had a chat with the newly minted northwest director of the American Farmland Trust, Hannah Clarke. She said data that will soon be released shows a shocking decline in farmland in this country. We’ll soon see data on our state and in the counties in North Central Washington, I’m told. The voluntary approaches that the Land Trusts take in conservation efforts make all the sense in the world. The dedication to finding common ground is the essence of community building which are essential as we face these challenges. 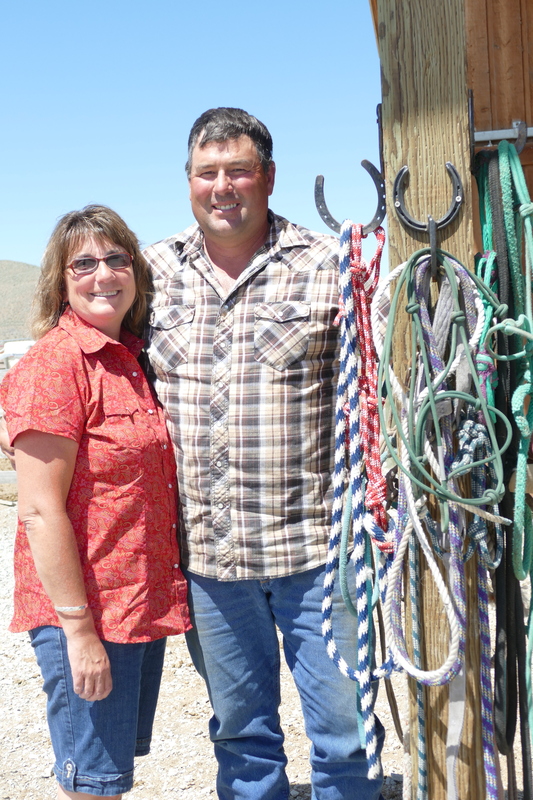 Next: Ranchers Derek and Noreen Olma discuss their conservation easement and why they made that choice for their family and agriculture.